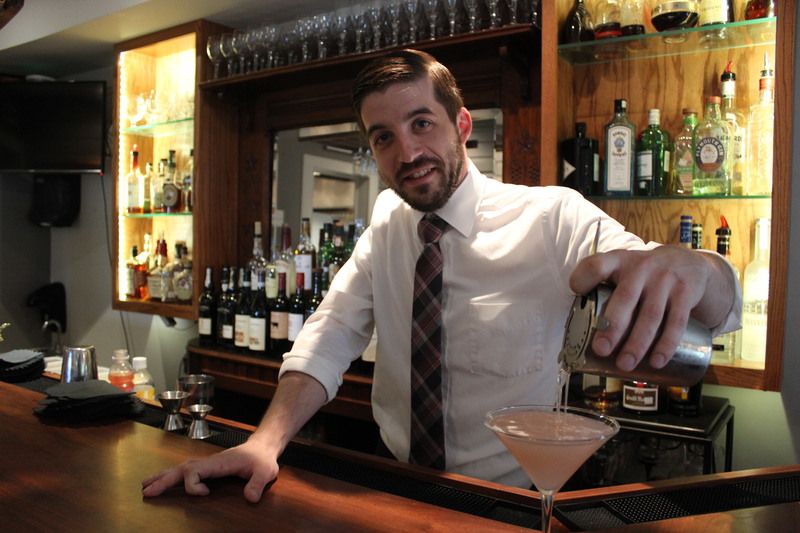 Elias serves up a Cedar Knoll specialty called the Bischon Frisee – in a chilled martini glass, add a little vodka, a little St. Germaine and a touch of grapefruit! Elias is behind the bar on Tuesdays through Saturday nights. Happy hour starts at 4! My journey began at Fast Eddies in Springfield. I started as a bar back and moved up to bartending day shifts from time to time. I was hooked from that moment. My biggest pet peeve would definitely have to be when people ask for multiple samples or tastes, after the third or fourth one I want to pull my hair out. Just decide already! See the answer to my pet peeve – this may be a way a few have gotten basically a “free” drink. Seriously, I haven’t really had anyone give me a clever line or try to a free drink from me. My policy is that if you treat me right, you might have a good chance of getting a little love back. I overheard a guy at the bar say to one of my female customers, “My buddies bet me that I couldn’t start a conversation with the prettiest girl in the bar. How about we buy some drinks with their money?” I rolled my eyes on that one but she accepted the offer and they drank together all night long. Not sure whatever came of those two. Every day is an interesting one here at Cedar Knoll. One particular night though, I did the worm at one of our clients wedding. A little boy was trying and no one got up to teach him. One of the servers asked the bride if I could show him and sure enough she was dragging me to the dance floor. It would have to be my Grandad Gido. He passed when I was younger and I never really got to truly know him. If he is anything like my father, that’s one hell of a man to have a drink with.